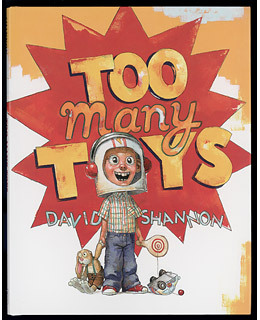 My son Nate, who is autistic, had a favorite book when he was four: David Shannon's Caldecott-honored, No, David! Ten years later, Shannon still has his knack for telling a story from both a kid's and an exasperated adult's point of view  and still draws the most hilarious, in-your-face pictures on the planet. Here, Spencer's mom tries desperately to get Spencer to give away some of his gazillion toys. Mom (picking up an Alien Space Ninja): "You haven't played with this in years." Spencer: "But I was just about to!" The ensuing wrangling over every toy will resonate with both sides in any household, as will the surprise ending. And for the record, the answer is no, my son still hasn't parted with his copy of No, David!